The art exhibit Visionary Aponte: Art & Black Freedom focuses on an extraordinary - and now lost - historical artifact: a "Book of Paintings" created by José Antonio Aponte, a free black carpenter, artist, and former soldier who was also the leader of an ambitious antislavery movement in Cuba during the Age of Revolution. During his trial, Aponte was forced to describe each of the pictures in his book, which portrayed a wide array of subjects, from Biblical scenes to episodes in the history of Africa, Europe, and the Americas. Using those descriptions, the invited artists, working across multiple mediums, have reimagined Aponte's book for our present and future. The Visionary Aponte exhibit will be on view at the Power Plant Gallery on the American Tobacco Campus from September 19, 2018, to November 17, 2018. 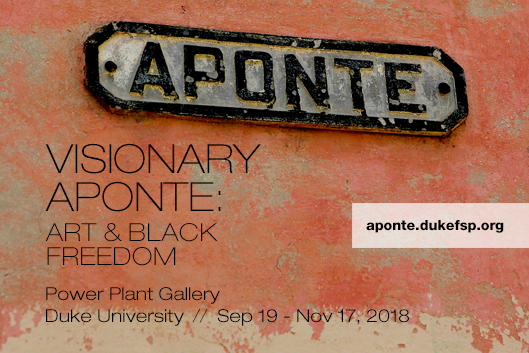 This event is the basis of Visionary Aponte: Art & Black Freedom, a nine-week exhibition and accompanying series of conversations, screenings, performances, residencies, and workshops at Duke University organized by the Power Plant Gallery and the Forum for Scholars and Publics. The exhibit is curated by Édouard Duval-Carrié and Ada Ferrer and is based on the digital humanities project Digital Aponte at http://aponte.hosting.nyu.edu.